Have any health insurance questions that you need answered? Let HealthCare.com help you find the information you’re looking for. What Are This Year’s Out-of-Pocket Costs for Medigap Plan K and Medigap Plan L? Medigap Plan K and Medigap Plan L are the two types of Medicare Supplement policies that charge you coinsurance (a fixed percentage of covered services). 2019’s out-of-pocket limit for Medigap Plan K: $5,560. The 2018 out-of-pocket limit for Medicare Supplement Plan K is $5,240. 2019’s out-of-pocket limit for Medigap Plan L: $2,780. The 2018 out-of-pocket limit for Medicare Supplement Plan L is: $2,620. How Does This Coinsurance Apply? You don’t owe coinsurance on the full cost of medical services with Plan K or Plan L.
Only the portion of your out-of-pocket costs that are not covered by Medicare Part A and Part B is shared with your Medicare Supplement plan. With Medicare Supplement Plan K, you’re responsible for 50 percent coinsurance. With Medicare Supplement Plan K, you’re responsible for 25 percent coinsurance. The out-of-pocket limits for these plans change annually. Changes are based on inflation estimates from the Centers for Medicare and Medicaid Services (CMS). Your coinsurance percentage on these plans does not change. While other Medicare Supplement plans don’t charge coinsurance, they typically have more expensive monthly premiums. If you’re considering Medicare Supplement Plan K or Plan L, you like to actively manage your expenses. You may also enjoy Medicare Supplement Plan N. Plan N has copayments the range from $20 to $50 per medical visit, but no coinsurance. Medicare Advantage plans are private Medicare replacements with their own fee structures and doctor networks. These plans have an annual out-of-pocket limit of their own. Costs for Original Medicare, and average costs for supplemental coverage, also change each year. It’s free to check your local options for Medicare Supplement and Medicare Advantage, no matter what your health conditions are. Will the Medicare Part B Premium Cost Increase in 2019? The Medicare Part B premium cost of $134 per month will increase to $135.50 per month in 2019. That’s a 1 percent increase from 2017 and 2018 prices, if you’re paying the standard premium. Is Your Part B Premium Automatically Deducted from Your Social Security? By law, Medicare cannot cause you to receive less in Social Security benefits than you did last year. However, Social Security benefits are expected to increase slightly in 2019, and so your increased Social Security payments will likely go towards your Part B premium. Are You Receiving Aid to Pay for Part B? You’ll have to check with your aid provider if your Medicare Part B premium is paid for with government or non-profit help, but the new year shouldn’t cause a significant change in your benefits. Is Your Medicare Part B Premium More Than $135.50 Per Month? The income-related monthly adjustment amount (or IRMAA) requires high earners to pay more than the standard Medicare Part B premium cost of $135.50 per month. High-income surcharges are based on your tax return from two years ago. Taxpayers who reported income of over $85,000 (or $170,000 if filing jointly) in 2017 may see premium increases of $54.10 or more per month. The IRMAA cutoff began at a much higher level until 2018. Over the past two years, the surcharge has been applied to more people. If your 2017 tax return no longer reflects your current living situation, you can contact Social Security to ask for a lower premium. Are You Enrolled in Medicare Advantage (Part C)? Although each Medicare Advantage plan is different, the government believes that monthly Medicare Advantage premiums will actually decrease by $1.81 per month in 2019! Even if it does increase in the future, your Medicare Part B premium is tax-deductible. What Was the Medicare Advantage Disenrollment Period? Between 2011 and 2018, there was an additional Medicare holiday to consider. From January 1 through February 14, the Medicare Advantage Disenrollment Period (MADP) gave you one more chance to leave your Medicare Advantage (Part C) plan. The Medicare Advantage Disenrollment Period will NOT return after 2018. An extended Medicare Open Enrollment Period replaces the MADP in 2019 and beyond. MADP History: The MADP originated with the Affordable Care Act in 2011, and was ended by the 21st Century Cures Act in 2016. Some Medicare advocates were concerned by this change – nevertheless, it was a change beyond CMS’ power to reverse. What Was The MADP? 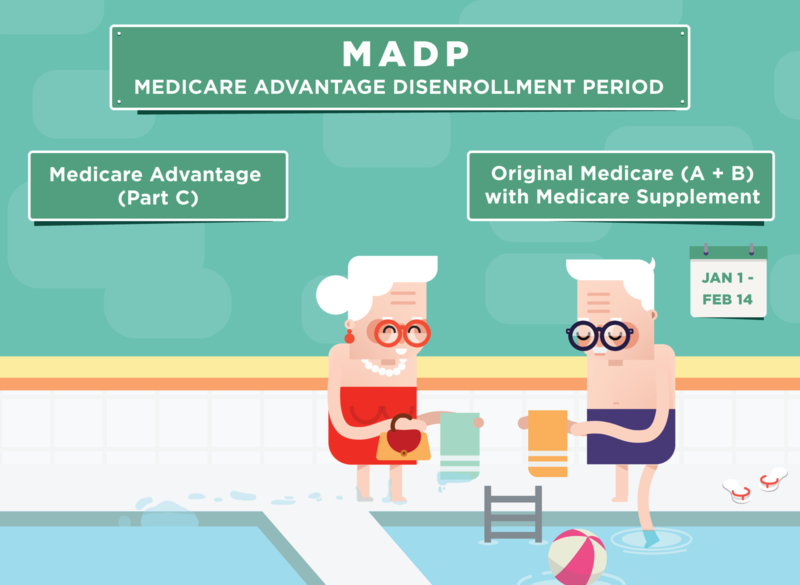 If you left your plan during the MADP, you would switch back to Original Medicare (Part A and Part B). You couldn’t join Part C via Original Medicare during that time. When you left a Medicare Advantage plan during your Disenrollment Period, your Part C plan would last through the end of the month. For instance: if you requested to leave your Medicare Advantage plan on January 27, your last day on the plan would be January 31. Extra Part A & B Coverage After Your MADP: You could add a Medicare Supplement plan (which pays your out-of-pocket costs) to your Original Medicare if you used the Medicare Advantage Disenrollment Period. Standalone Medicare Part D After Your MADP: If you used the Disenrollment Period to leave a Medicare Advantage plan, then you could join a standalone Medicare Part D RX drug plan during this time (through February 14). This was available to you even if your coverage didn’t include Part D before you left. Does Health Insurance Cover Hospice Care? Hospice care gives comprehensive end-of-life support to those who have 6 months or less to live. Hospice providers focus on making you comfortable during a terminal illness. Hospice is generally thought of as an inpatient service – whether in a dedicated facility or part of a hospital – although in-home hospice care is common. Hospice providers may help you, your family, and your caregiver. Private Health Insurance: Most health insurance plans – including Obamacare and employer plans – will cover hospice care nearly in full. Your hospice stay will likely come with a dedicated caregiver, any medical equipment you need, and emotional support. When in hospice, your plan can pay for non-medical benefits like food or music therapy. Your health insurance may want a doctor to verify that your condition is terminal before agreeing to pay for hospice. Your health insurance may ask you to stop receiving curative treatments for your medical condition. Short-Term Health Insurance: These plans rarely interact with hospice care, since temporary insurance plans may not accept new members with chronic or terminal illnesses. It’s possible that you could qualify for hospice care while on short-term insurance if you’re in a serious accident. All short-term plans are different. While some plans might not cover hospice care, other plans will treat it like any other benefit. Once you qualify for hospice, a short-term plan could pay for your hospice care in full if you’ve met your deductible and out-of-pocket maximum. Medicaid: In most states, Medicaid will cover hospice care almost in full. Medicaid’s hospice benefits are similar to Medicare. TRICARE and VA : Veterans’ programs pay for hospice care in the United States and its territories. Other Insurance Products: Many independent insurance agents sell long-term care insurance, a type of benefit that pays out. Some life insurance plans also include a living benefit rider, which gives you an advance life insurance payment. Medicare and Hospices: Medicare accounts for most U.S. hospice spending. Your mandatory Medicare Part A covers most hospice costs. All Medicare Supplement plans cover your copayments for hospice pain and symptom management prescriptions; and will also take care of your 5 percent copayment for inpatient respite care, which gives time off for you and your primary caregiver if you’re faced with a life-limiting disease. Since Medicare Part A covers hospices, optional Medicare Advantage plans (which replace your Original Medicare) take care of hospices as well. Does My Health Insurance Cover Walkers, Wheelchairs, and Other Walking Aids? Accountable Care Organizations, or ACOs, are programs that work to provide higher quality care to Medicare enrollees. They consolidate all of the roles that treat patients – health insurance providers, doctors, and hospitals – to focus on primary care. There are many benefits for patients who participate in Accountable Care Organizations. Firstly, your Medicare benefits will stay the same. Your payments won’t increase and you’ll receive any and all treatments that you require. You can also choose your preferred physician or hospital that accepts Medicare. ACOs allow you, the patient, to continue making important decisions regarding your health. As individuals become older, they often require more care due to the increased risk for certain illnesses. By collaboratively keeping an eye on patients, health professionals in ACOs can detect and treat diseases earlier, leading to a healthier population. You must live in the United States or U.S. territories and possessions. Once you have received at least one primary care service within the ACO, you will be assigned as a participating beneficiary. Former Secretary of the Department of Health and Human Services, Kathleen Sebelius, has stated that “Accountable Care Organizations will improve coordination and communication among doctors and hospitals, improve the quality of the care their patients receive, and help lower costs.” Since 2010, ACOs have continued to seek the best treatments for Medicare enrollees to avoid medical delays. If people with Medicare routinely visit a primary care physician, they can avoid costly trips to the emergency room – this is the thought behind the implementation of ACOs. ACOs have also saved money for the Medicare program. By preventing accidents and other illnesses, ACOs have changed the delivery of healthcare to individuals with Medicare. How Do Accountable Care Organizations Save Money? ACOs were created as a senior-focused part of the Affordable Care Act, (or “Obamacare”). They work by taking responsibility for Medicare patients’ cost and quality of care experience. Accountable Care Organizations use a “Shared Saving Program” as their payment model to promote efficiency within the healthcare system. Payments to ACOs are directly related to quality, with the overall goal to reduce costs for the government. ACOs track their performance through data to measure the providers’ success with patients. By helping Medicare enrollees maintain their health, they can share the savings from Medicare. The bottom line is: the better care ACOs provide for patients, the more money they make. As of January 2018, there are 561 Accountable Care Organizations participating in the Shared Saving Program. This number has continued to increase since the ACO’s beginnings in 2010, integrating in the healthcare system to operate smoothly. There are ACOs in almost every state, including the District of Columbia. Passed in February 2018, the CHRONIC Care Act will increase government support for ACOs. Programs will now be able to incentivize chronically ill patients to seek primary care by offering up to $20 per visit. This means you’ll be paid to seek care from physicians. Since 2012, the number of individuals assigned to ACOs has more than tripled. Healthcare professionals and government officials have noted how this improved efficiency in ACOs. ACOs have sustainably helped individuals with disease management and preventive care, while saving costs on long-term medical expenses. If I’m Not a U.S. Citizen, Can I Still Be Eligible for Medicaid? Undocumented immigrants are not eligible to enroll in Medicaid. Once you are a qualified immigrant, you have to wait 5 years in order to apply for and receive coverage from Medicaid. However, some non-citizens may be exempt from this waiting period depending on their circumstances. If you are a qualified immigrant, you must also meet your state’s eligibility requirements on income and household size for Medicaid. Depending on the state you live in, you can follow the income guideline, which includes the number of individuals in your family/household. It’s important to double check your immigration status as well as your qualifications to see if you are eligible for Medicaid. Researching the basics on Medicaid can help you in the process of finding coverage as a non-citizen. Plans under Medicaid can vary depending on the state but most should cover certain essential services. You can apply for Medicaid at any point of the year. If you meet the income and residency requirements for your state, you may be able to receive coverage. Medicaid is extraordinarily helpful if you are eligible to enroll. Since 2013, there has been an 18.6 percent increase in Medicaid enrollees and this number is only increasing. Are College Students Allowed to Get Health Insurance? Yes, college students can receive health insurance and are encouraged by their schools to be enrolled in a plan. Being insured will bring you relief during your time at college. Searching on your school’s health services website will lead you to specific requirements and policies regarding insurance for students. Your location and ability to pay for insurance can both play important roles when choosing a plan. Continue to stay on your family’s plan. If you’re 26-years-old or younger, you can still be covered under a parent’s health insurance plan. Depending on your parent’s provider, the cost of a family plan may increase, which may affect your final decision in choosing a plan. Enroll in your university’s comprehensive student health plan. Many schools offer health plans for students to enroll in, at lower prices than you could get on your own. Some plans, but not all, come with dental and vision coverage. For students receiving financial aid, monthly premium costs may be subsidized. Apply for state or federal programs, such as Medicaid. Older or independent students may qualify for programs like Medicaid that are funded by the government. It may be difficult to find coverage through these programs, as they are often limited to a select group of individuals. Short-term health insurance can be a surprisingly affordable option for students who need insurance coverage on a temporary basis. These plans can last anywhere from 30 to to 90 days. For students in-between school plans, short-term health insurance can be the perfect fit. Students should look into a health insurance plan that meets their individual needs, as well as their college’s standards, with a close eye. By enrolling in a plan, you’ll enjoy your time in school without worrying about whether or not you’re covered. What Does Medicare Part A Cover in Skilled Nursing Facilities? Coverage for skilled nursing facilities (also known as SNFs for short) is provided by Medicare Part A. Medicare includes coverage in a SNF under certain situations for limited time periods. It is crucial that you understand what those conditions and time periods are to ensure that your stay in a SNF is Medicare-covered. You’ll also want to know what costs you may still incur as a Medicare beneficiary that needs care offered by a SNF. What Services Does Medicare Part A Cover in a Skilled Nursing Facility? Ambulance transportation, if medically necessary, to the nearest provider of needed services not offered at your SNF. Important to note: the costs below pertain to someone who has coverage through Medicare Part A only. If you have additional supplemental coverage through a Medigap plan, most plans cover the SNF daily coinsurance amounts that you incur on days 21-100. If you have a Medicare Advantage plan, your coverage and costs may vary from what is offered under traditional Medicare, and you should review your plan’s unique “Summary of Benefits” to determine what coverage it offers. Your reason for needing skilled care in a SNF must be related to the qualifying hospital stay or be the result of a condition that started while you were hospitalized or getting care in a SNF. If you meet the above criteria, your stay in a SNF would be Medicare-covered. What Are Your Costs for a Medicare-Covered Stay in a Skilled Nursing Facility in 2018? Medicare Part A provides coverage for a Medicare-covered skilled nursing facility stay. However, this does not mean that you are covered at 100% for all costs indefinitely. As with other parts of Medicare and other services, there are some out-of-pocket costs. For days 1-20 of a Medicare-covered SNF stay, Medicare covers the full amount of the stay with no out-of-pocket costs to the Medicare beneficiary. After day 20, for days 21-100, you would be responsible for a daily coinsurance amount of $167.50 per day. After day 100, there is no Medicare coverage for a SNF and you would be responsible for all costs. If you have a break in SNF care that lasts 60 days or more, your benefit period would reset. This means that Medicare coverage for SNF benefits is reset, and the maximum coverage available would be 100 days for a new stay in a SNF. Can Medicare Part A Be Canceled, Waived or Deferred? How Long Is A Health Insurance Plan Year? Health insurance and Medicare plans that you buy on your own usually run on a calendar year schedule – January 1 to December 31. That’s all 365 days. This is helpful to know when you’re figuring out how much you’ve spent towards your deductible or your out-of-pocket maximum. However, plans don’t have to last for 365 days if you bought them in the middle of the year. Health insurance and Medicare plans generally make changes to covered benefits, deductibles, co-payments, and monthly premiums at the start of each calendar year. Keeping and Leaving Health Insurance: When you buy a health insurance plan at the end of the year, make sure that you’re signing up for the correct year. For instance, plans for 2019 will be available at the end of 2018. But even if you purchase a 2019 plan in 2018, that plan won’t start until January 1. You can also join new health insurance plans each year. Since 2014, insurance companies must cover you if you’re sick, and they can’t charge you extra for being sick. You can sign up to have your plan renew automatically each year, although doing so will put you at risk of higher costs. You may also be able to cancel your plan before it expires if you don’t like it. When Does My Health Insurance Plan End? Technically, your health insurance continues each year if you decide to remain on your plan. Health plans can last for multiple years even if they look different from year to year. For instance, your member ID may remain the same each year. 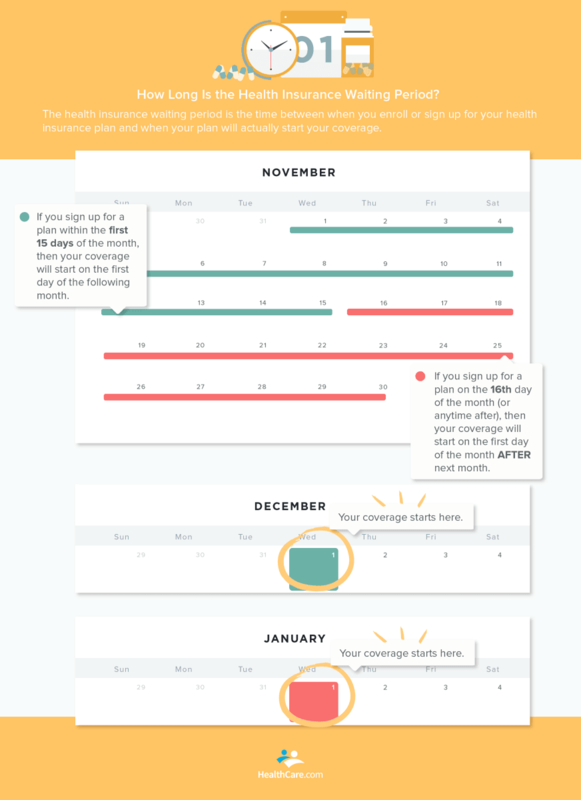 If You Got Health Insurance in the Middle of the Year: Your plan’s year will still end on December 31. Since you pay for health insurance each month instead of a once per year payment, your cost to stay on the plan will be the same. However, your plan’s benefits, deductibles and out-of-pocket maximums will be the same as if you had bought your health insurance plan at the beginning of the year. This means that you’ll have less time to use the benefits of your plan. For example, instead of having 12 months to reach a $1,000 deductible, your deductible will reset at the beginning of the new year. If You Got Health Insurance From Your Employer: If you got health insurance through your workplace, your plan year may be on a different schedule. The plan will not be able to kick you off as an individual, although your employer can change health insurance companies, or you can ask to leave the plan. Changes to employer-sponsored plans will usually take effect on January 1. If You’re Leaving Your Employer’s Health Plan: You can continue on your employer’s health plan (or your spouse’s health plan, if you’re no longer eligible) using an option called COBRA. With COBRA, you’ll be able to continue the plan on your own for up to 36 months. However, you’ll have to pay the full cost of the plan. If you’re dealing with medical issues, this expensive option may be worth it. However, most people leaving employer-sponsored insurance try to buy new health insurance coverage on their own (which you can do any time that you lose previous coverage). What About Temporary Health Insurance? Also known as short-term health insurance plans, these policies can start any time but only last for a maximum of 90 days. Your ability to renew short-term coverage depends on your health status and your state. These plans cover healthy people in case of emergencies, or a break in their traditional “major medical” health insurance coverage. Temporary health insurance plans do not count as health insurance for Obamacare tax purposes. What About My Medicare Supplement, Part C, or Part D Plan? Medicare plan years generally keep to the same schedule as health insurance plans for people under the age of 65. However, the guidelines for enrollment and plan renewal are different, depending on what coverage you have. Learn more on our Medicare info webpages. What Happens if My Short-Term Health Insurance Ends While I’m Hospitalized? Your temporary (or “short-term”) health insurance coverage might continue if you’re hospitalized when your plan expires. To find out if it applies to your plan, you’ll want to look for the “continuation of coverage” or “extension of benefits” provision in your plan’s policy. Finding Your Policy: To find out if your short-term plan allows you to stay covered if you’re in the hospital when it expires, look at your insurance contract (this contract is also known as your plan’s certificate of insurance). You will receive the contract each time you sign up for or renew your coverage. Search the contract for “total disability”, “continuation of coverage” or “extension of benefits”. Total Disability: You can’t be expected to perform work while you’re in the hospital. This means that you are considered “totally disabled” for insurance purposes at the time. What the Provision Means: Since you’re totally disabled in the hospital, benefits that would have otherwise been paid by your short-term insurance plan might still be covered while you’re in the hospital. Coverage typically stops after you leave the hospital, or once a set period of time ends (whichever is sooner). You will likely still lose coverage once you’re discharged from the hospital. However, a continuation of coverage clause might stop the plan from ending during the middle of your stay. How to Get Coverage Once Your Short-Term Plan Expires: Your temporary health insurance won’t be renewed if you’re hospitalized when it expires. Even so, there may still be easy coverage available to you. In some states, total disability can qualify you for Medicaid. Qualified patients can apply for and enroll in Medicaid at any time, including from the hospital. Additionally, if you are rejected from Medicaid, then you may be able to enroll in an Affordable Care Act plan. Normally these plans are only available during certain times of the year. What Is Short-Term Health Insurance? Temporary health insurance plans have many differences from Obamacare and most other health insurance. You can join a temporary plan at any time. Plans last for a maximum of 90 days (but many insurance carriers allow you to re-apply every 90 days, depending on state regulations). These plans have low monthly costs, and in some cases, high deductibles. You will have to pay a tax penalty if you rely on them for health insurance for more than 90 days, as they don’t guarantee coverage for all of the Affordable Care Act’s essential health benefits. If you’re not familiar with short-term health insurance, learn more to see if this limited plan type is right for you. How Do I Change a Health Insurance Quote to Include Members of My Family? Existing HealthCare.com price quotes cannot be modified at this time. You can start a new quote to get pricing for a different family size or to change other previously submitted information. How Can I Submit a Complaint About a Broker Who Called Me? In the rare instance that you have an issue with the licensed agent you matched with on our website, we encourage you to email us directly or leave a comment on our contact page. We would also encourage you to save incoming telephone numbers or other identifying information and report that to us. This allows us to proactively identify any of our independent partners that have failed to follow acceptable business practices. If you receive an unacceptable number of calls from licensed agents, you can file a stop contact request. Do Not Contact: I no longer want to speak with a health insurance broker. How do I stop further contact? Please fill out our request form and select the “Do Not Contact” inquiry type, if you’d no longer like to hear from the insurance broker you matched with on HealthCare.com. We will process your request immediately. We take do not contact requests extremely seriously. Make sure to submit the email or phone number that you used before, otherwise we will not be able to identify your record. If you did not use HealthCare.com, HealthCare.org, or HealthCare.net to request a price quote, then we do not have your information and will not be able to assist you. We will order the unaffiliated, independent agent who you matched with to stop contacting you. We do not sell health insurance ourselves (with the exception of Pivot Health plans). Email Unsubscribes: There is at least 1 unsubscribe link in each email that we send out – usually in both the header and the footer. If you wish to unsubscribe from future messages, you can click that unsubscribe link any time. Is HealthCare.com part of a state or federal government website? HealthCare.com does not have any direct or indirect affiliation with any government agency…apart from paying our taxes. We are NOT part of healthcare.gov, medicare.gov, or medicaid.gov. We are a privately-owned company. We have existed since before healthcare.gov was created! You can join many of the same healthcare plans, at the exact same price, on government websites or private websites like HealthCare.com. We’re also able to compare certain plans that haven’t signed up to be on government websites. To speak with healthcare.gov, visit https://www.healthcare.gov/contact-us/. Who Is HealthCare.Com, and How Does the Site Work? HealthCare.com is operated by Healthcare, Inc. Since 2006, we’ve been a leading search, comparison and recommendation tool for people of all ages who buy their own health insurance. We’re a group of healthcare fans who can help you sign up for Obamacare, short-term medical, and Medicare insurance plans. We’re not a government website. Our users can analyze hundreds of local health insurance options, then get data-rich recommendations to help make smarter decisions about their health plan purchase. We connect you to licensed, independent agents at call centers, insurance carriers, and web-based brokers. You can learn more about our team and our history at HealthCare.com/about. To sign up for health insurance using HealthCare.com, you’ll enroll the way you choose – by phone, by web form, or by filling out a form to be contacted later by an insurance agent. For more information, read our guide to buying individual health insurance. Do You Still Have to Pay a Penalty for Not Having Health Insurance in 2017? Yes, you still have to pay a tax penalty if you didn’t have health insurance in 2017. Recent changes in Washington, D.C. will end the Obamacare penalty (also called the individual mandate) starting in 2019. For now, you still have to have health insurance. How Much Is the Penalty for Not Having Health Insurance in 2017? 2.5% of your total household adjusted gross income for 2017. For more information, read our guide on How to Calculate Your Obamacare Tax Penalty. What if I Had Health Insurance for Some Months But not Others? The penalty will decrease if you had qualifying health insurance in some months. For example, if you only had health insurance from August through December 2017, then your penalty would be reduced by 50 percent – for a minimum of $347.50, depending on your income. If you went without health insurance for less than 3 months, then you’re “exempt”, meaning that you don’t have to pay a penalty. This Get Out of Jail Free Card doesn’t work if you go without health insurance for 3 months or more. If you spent that much time without health insurance, then you’ll be penalized for missing every month. How Will I Know How Many Months I Had Health Insurance For? Your insurance company will mail a 1095 form to your address. This form will tell you which months you were insured. The form is usually sent to jog your memory. Most people don’t have to send it to the IRS. Should I Prepare for a 2018 Penalty? The penalty will be the same for 2018, before ending in 2019. Are Health Insurance Subsidies Based on This Year’s Income? Do We Have to Add Our 22-Year-Old to Our Health Policy, or Can She Sign Up On Her Own? You don’t have to add your children to your existing healthcare plan. However, in most circumstances, it should be easy to keep your children on your existing plan through their 26th birthday. You Can Always Add Children During An Enrollment Period: Young people can join their parent’s Affordable Care Act-compatible plan until they turn 26 years old. Their parent can add them to new or existing coverage during the annual Open Enrollment Period, or during a Special Enrollment Period. Those under the age of 26 are eligible to join their parent’s insurance in any circumstance. You can add your child to your plan whether or not they’re in school, or employed, or living at home, or parenting, or married. Adding A Child To Your Plan: Putting a young person on your health plan is easy to do. Just contact your insurance provider, and have your child’s information at hand. Your premiums will probably increase, but it may be less expensive for your child than if they had bought healthcare on their own. Other Options Are Available: An independent young person can also explore other healthcare options on their own. If your daughter was not listed as a dependent on your tax return, she could qualify on her own for Medicaid or high Obamacare premium subsidies. There’s also no rule against her getting insurance coverage through her own employer. A younger child could qualify for state-run child health programs. Joining an existing health insurance plan is not always the best choice for your child. If your child looks for a plan on their own (or leaves your insurance after turning 26), make sure that they sign up within 60 days of a qualifying life event or during the annual open enrollment period. Losing insurance coverage counts as a qualifying life event. What’s the 2018 Deductible for Medicare Supplement High-Deductible Plan F? Medicare Supplement high-deductible Plan F is considered a cheaper alternative to a regular Plan F plan – featuring lower monthly premiums in exchange for having to deal with a higher deductible. This deductible level changes from year to year. For 2018, the Medicare Supplement high-deductible Plan F comes with a deductible of $2,240. This deductible amount changes every year, no matter when you first bought your plan. A deductible is the amount that you pay out-of-pocket each year before your benefits kick in. Payments made by Original Medicare (Medicare Part A & Medicare Part B) will not count towards your deductible. The $2,240 deductible is an increase of $40 from 2017. Last year, the deductible level was $2,200. The 2018 deductible limit for high-deductible Plan J is also $2,240. The 2018 Plan F deductible only applies to the high-deductible versions of each plan. Beneficiaries who are enrolled in a standard Plan F and Plan J do not have a deductible. Why Did the Deductible Change? Medicare Supplement rules are set by federal regulations. The deductible number for high-deductible Plan F and Plan J rises in accordance with the August Consumer Price Index each year. Note that all plans of the same type (for instance, each and every Plan A option available on the market) have the exact same deductibles and benefits, no matter which company you buy your plan from. How Does HealthCare.com Make Money? We present health insurance and Medicare coverage options to our visitors (either plans themselves or third-party websites). We then match users to independent, licensed health insurance agents who will help you finish signing up. We consider this to be an ad-driven business model, similar to Kayak.com or Trivago in online travel. HealthCare.com may earn revenue for leads, clicks, calls and applications generated, and may be compensated by its advertisers for sponsored products and services. Shouldn’t I Just Buy Directly From the Insurer or Healthcare.gov? We have worked hard to establish relationships with the best data sources around. Rates and plans come from the insurance companies themselves, who have approved the plan inventory we display before we publish them. That said, you’ll need to confirm the final pricing with whichever provider you choose to buy from. Keep in mind that the rates are dependent on the accuracy of the quote information you provide them. Disability and Medicare: Can I Get Medicare Before 65 If I’m Disabled? Where Can I Get a Copy of My 1095 Tax Form? Contact Your Insurer Directly: Looking for your 1095 tax form? Contact your insurer directly to get a copy of your 1095 form – ONLY your insurer will have access to your 1095 tax form and can provide you with a copy. Click here if you purchased your plan via healthcare.gov. If you get healthcare from your employer, contact your company’s benefits department. If you found your coverage through our plan comparison tool, you’ll still need to contact your insurer; we don’t have access to anyone’s 1095 tax form. How Can I Find My Insurer? Call the main number on the back of your insurance card. If you can’t find your insurance card, use a search engine to reach your insurance company. Even if you’re no longer enrolled, your insurance provider still has to promptly mail a 1095 tax form if you request it. What Is a 1095 Form? The 1095 tax form is a simple letter from your insurance provider that lists each month you had health insurance. You generally need to have coverage for 9 months to avoid a tax penalty. The 1095 form serves as proof for tax purposes. Your 1095 form may also include the information that you’ll need to file for health tax credits, which can be a huge help to you. Do I Need a 1095 to Pay My Taxes? Your 1095 document may be called a 1095-A, 1095-B, or 1095-C form, depending on what type of health insurance you had last year. If you’re expecting a 1095-A, you will need the form before you finish your taxes. People who receive health insurance subsidies generally get a 1095-A. If you’re only expecting a 1095-B or a 1095-C, you can typically mail your taxes without the form, as long as you know whether or not you were insured. If you received health insurance through an employer, or through a government program like Medicaid or Medicare, you’ll probably get a 1095-B or 1095-C.
How Many 1095 Forms Should I Expect? You’ll receive a 1095 form from each health plan you had over the past calendar year. You won’t receive a 1095 if you didn’t have health insurance during the previous year, since the form comes from your insurance carrier. What If I Had A Short-Term Plan? Short-term plans, also known as temporary health insurance, cannot send you a 1095 form. These are plans specially designed to be temporary – they’re not the same thing as having comprehensive health insurance for a limited period of time. These plans do not count as health insurance under the Affordable Care Act. How Long Should It Take to Get My 1095? Since your taxes are due on April 15, you should generally expect to receive your 1095 tax form by March. HealthCare.com CANNOT Provide Your 1095 Form – Calling HealthCare.com will only make it harder to get your 1095 form. HealthCare.com connects you to health insurance brokers, who are unable to transfer you to health insurance customer service. Our partners would not know whether or not you had health insurance last year. Our partners do not have the information required to provide 1095 forms. Do you have the right health insurance coverage? Don’t have coverage to begin with? Search our database of individual health insurance plans and find the right plan for you. Does Medicare Part D Cover Insulin? Medicare Part D provides coverage for a range of diabetes supplies, including insulin. The supplemental prescription drug coverage which Part D provides is critical to have if you’re a Medicare beneficiary who uses injectable insulin to manage diabetes. With the exception of insulin pumps, which are covered as durable medical equipment under Medicare Part B, all supplies used to deliver insulin, such as syringes, needles, alcohol swabs, gauze pads, and insulin pens, are covered by Part D drug plans. However, the supplies covered under Part D include only the devices and supplies that are necessary to take insulin. Other supplies used to manage and control diabetes, such as blood sugar testing strips, will fall under the coverage of Medicare Part B.
It’s not uncommon for diabetes patients requiring insulin to end up in the Medicare coverage gap known as the “donut hole,” where they’re responsible for paying a larger percentage of the cost for insulin. When this happens, a diabetic patient’s out-of-pocket costs at the pharmacy will increase dramatically, so it’s very important for these patients to budget for its increasing cost. If you’re looking for more comprehensive coverage, check out some of your Medicare coverage options. Look through our database of Medicare Supplement and Medicare Advantage plans to see what works best for you. What Is a POS Health Plan? With POS (Point of Service) plan coverage, health insurance policyholders receive care at a lower cost when they receive care from in-network doctors, though this type of plan also includes coverage for out-of-network care (with a referral). POS plans require policyholders to elect a primary care physician (PCP) and they must obtain a referral from their PCP before seeing a specialist – even if that specialist is in-network. In essence, POS plans offer lower medical costs in exchange for a more limited choice of providers. It’s important to note while POS plans may provide partial out-of-network coverage, it is the patient’s responsibility to pay bills and fill out necessary claim forms in order to be reimbursed for the out-of-network care they receive. If you’re dissatisfied with your current healthcare plan, consider changing your health insurance policy. Search our database of individual health insurance plans and find the right plan for you. What Is an EPO Health Plan? An EPO health plan is an “Exclusive Provider Organization” plan. With an EPO (Exclusive Provider Organization) healthcare plan, your care is covered when you see a doctor in the network. If you get care from doctors or hospitals outside the network, it won’t be covered; EPOs lack out-of-network benefits. In addition, EPO plans do not require referrals in order to see a specialist. EPOs are often described as a kind of hybrid between HMOs (Health Maintenance Organization) and PPOs (Preferred Provider Organization). Like an HMO, EPO plans do not cover care received from out-of-network providers. And similar to a PPO, EPO plans do not require that you get a referral from your primary care physician in order to see a specialist. You can make appointments directly with a specialist without having to see your primary care physician first. EPO plans tend to be cheaper than other plan types, but they also limit policyholders to a smaller network of doctors and healthcare providers. Prior authorization requires your physician to get approval from your insurance provider before he or she can prescribe you certain medications or treatments. Without getting this prior approval, your health insurance provider may not cover the cost of your medication (or operation or treatment), and you’ll have to pay for those medical costs out-of-pocket. That medical services aren’t being duplicated. This tends to be a concern when multiple specialists are involved in someone’s care and treatment plan. As a cost-saving tactic, prior authorization for medication can be effective – especially in situations when your physician prescribes an expensive drug when a cheaper alternative exists. Prior authorization is your insurance provider’s way of ensuring you receive cost-effective care. If you have trouble with your current healthcare plan, consider changing your insurance policy. Search our database of individual health insurance plans and find the right plan for you. The amount you pay each month for your health insurance plan is called your “premium”. Think of this as a monthly subscription fee. You’ll only hear this term used to refer to your monthly bill. Depending on how thorough your health insurance plan is, and how much your insurance company contributes to your care – per the type of plan you’ve chosen – your health insurance premium could be higher or lower. For example, a bronze-level HMO plan will have a lower monthly premium compared to a gold-level PPO plan. Why do insurance plans use the word “premium” instead of “cost”? The true answer is probably lost to history, but the word premium has been used at least since insurance became commonplace in the 18th century. The word premium may be derived from Latin, in which it is roughly translated as “to pay before” something occurs. Not satisfied with the amount of your monthly premium? Want to check out other plans? Learn more about the different health insurance plans available to you. What Does Out-of-Pocket Mean in Health Insurance? 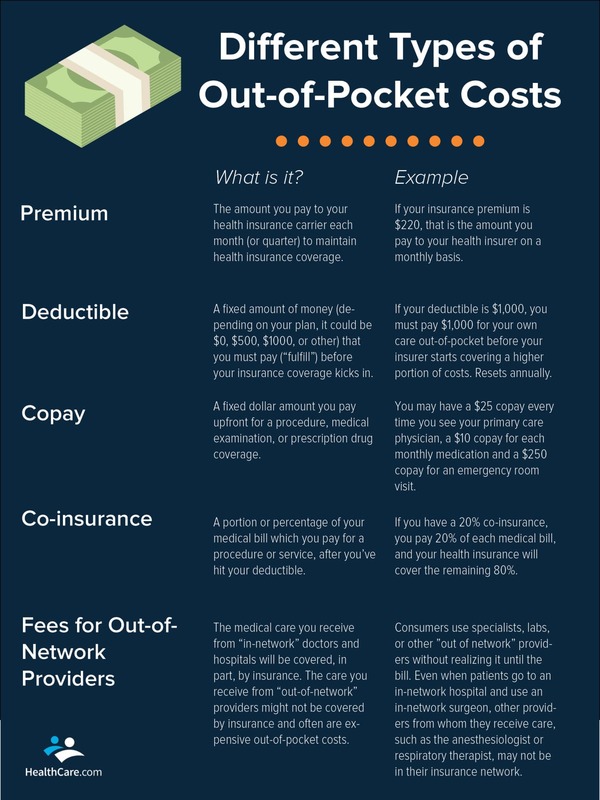 Within the context of healthcare, “out-of-pocket” often refers to out-of-pocket costs – specifically, medical expenses which you pay by yourself, instead of expenses where your insurance foots the bill. Medical services that are covered by your insurance plan can still have an out-of-pocket component. Out-of-pocket costs include copayments, deductibles, and coinsurance for covered health services. For instance, Affordable Care Act health insurance plans are categorized by metal levels, going from bronze to platinum, in which you’ll pay from 10 percent to 40 percent of your costs out-of-pocket. If your insurance plan doesn’t cover a certain doctor or service, you’d be paying for it entirely out-of-pocket – that is, all by yourself. Most types of health insurance include an annual out-of-pocket maximum, or an amount after which you don’t have to pay for anything else out-of-pocket for covered costs, once you’ve reached that spending amount. This out-of-pocket maximum may or may not include deductibles or premiums when calculated. Not satisfied with the amount of your out-of-pocket costs? Want to check out other plans? Learn more about the different health insurance plans available to you. Can Medical Bills Go on Your Credit Report? Yes. That’s right — unpaid medical bills go on your credit report and can potentially hurt your credit score. Medical expenses actually account for a significant percentage of bankruptcy filings in the United States. While doctors and hospitals don’t report debts to consumer credit bureaus, it’s fairly common for healthcare providers to turn over an unpaid debt to third-party collection agencies who will share this information. When this happens, your failure to pay a bill will affect one of the most important factors in determining your credit score: your payment history. Let’s say you have yet to pay the bill from your most recent visit to the dermatologist. If the bill remains unpaid for long enough, your doctor may turn over your unpaid debt to a collections agency; in all likelihood, a collector will then contact you in an effort to get you to pay up. At this point, your credit report may indicate your unpaid bill as having gone to collections. The extent to which medical debt can affect your credit score depends on the type of scoring model used by a potential creditor to check your creditworthiness. FICO 8, the scoring model which many lenders rely on, records all collections, regardless of whether the charges were eventually paid. That is to say, even if you eventually paid off your debt, your credit report may reflect that the bill you paid off went to collections. Collections accounts can take up to seven years to drop off your credit report, although the impact on your credit score will lessen over time. As of September 15, 2017, the three major credit reporting agencies – Equifax, Experian, and TransUnion – must allow a 180-day waiting period to elapse adding unpaid medical debts to people’s credit reports. The waiting period affords patients/policyholders some time to resolve outstanding medical bills with their healthcare and insurance providers. If you’re having a difficult time paying for medical bills, or if you find yourself underinsured, there are several free or discounted healthcare options that may be available to you. Whether you’re looking to compare different coverage options or need help identifying the best plan for your needs, we can help you find it. Search our database of individual health insurance plans and find the right plan for you. It’s unlikely that you’ll find short-term insurance that covers pre-existing conditions. Generally, your individual claims will be denied if they resulted from a pre-existing medical condition. Short-term insurers can even outright decline to insure you due to your medical history or current health status. The length of time that short-term policies “look back” on pre-existing conditions varies by state, ranging from the previous six months to five years. If you’d like to purchase another short-term policy after the first policy expires, your new plan may not cover conditions that developed during the term of your first policy. You’ll be able to ask your insurance company what is covered before buying a plan. Ongoing Health Problems Are Not Covered: Since short-term health policies are designed to take care of immediate health needs, they are unsuitable for long-term maintenance of health issues. Short-term plans rarely cover medical devices, dental care, or vision care. Prescription costs are typically the planholder’s responsibility outside of a hospital setting as well. You Will Get Emergency Care: Peace of mind from unexpected medical costs is a major benefit of short-term coverage. If you’re seriously ill or injured, short term insurance will cover the costs of your hospital visit. Short-term policies also cover follow-up care for acute medical issues until your coverage ends. You Can See A Primary Care Doctor: Nearly all doctors accept short term insurance. You will receive a welcome letter, insurance card, and other familiar benefits when you enroll. Although you have to pay for care on your own before hitting your deductible, the costs for a visit once you do reach your deductible are generally low. Some plans also include a checkup, free of charge. You Can See a Specialist: Specialized doctors (such as a dermatologist, orthopedist, or neurologist) are frequently covered by short term plans. Medical imaging (like x-rays) and mental health care are also common short-term benefits. Short term plans often bundle in additional benefits such as life insurance or prescription drug discounts as well. It only takes a few minutes to get a quote for a temporary health insurance plan. It’s a good idea to learn if you’re eligible by applying for coverage. If temporary health insurance doesn’t work for you, there are several other Obamacare alternatives you can turn to. A copayment is a fixed payment that you owe for certain medical services. Unlike coinsurance, the size of a copayment doesn’t depend on the cost of the service. Copayments are usually charged for primary care visits and prescription drugs. You can also call copayments “copay”. Sometimes you may be asked to give your copayment directly to a medical professional, while other times you may receive a bill from your insurance company. To consider how copayments work, imagine that one doctor charges $250 for routine visits while another doctor charges $125. If you see both doctors – and your copay for routine visits is $20 – then you’ll owe a total of $40. The remaining costs ($230 for one doctor and $105 for the other) will be billed to your insurance company. Note that copayments are not the same thing as coinsurance. Copayments are fixed, while your coinsurance payments will vary based on the price of a procedure. How Is Copayment Different from Coinsurance? A coinsurance amount is usually defined as a percentage of the cost of medical care that you would pay, with the remainder being paid by your insurance company. Copayments, on the other hand, are fixed amounts and not at all dependent on the price of any particular medical procedure or service. You can read more about coinsurance here. Not satisfied with your copayments? Want to check out other plans that contribute more towards your medical costs? Learn more about the different health insurance plans available to you. A coinsurance amount is usually defined as a percentage of the cost of medical care that you would pay, with the remainder being paid by your insurance company. For example, assume your coinsurance amount is 20 percent. If the cost of a procedure is $1,000, – assuming your deductible has already been met – this means the insurance company would pay $800, while you would be responsible for the remaining $200. In this example, your coinsurance may read as “80/20” (80 percent paid for by your insurer, 20 percent paid by you). This isn’t standard, though; usually, you’ll see “X% coinsurance” – so, if your plan states a “100% coinsurance” that means that you, as the policyholder, is responsible for 100 percent of the procedure out-of-pocket. Insurance plans usually set coinsurance amounts at 20 percent or 30 percent. These are also capped at a certain amount per benefit period which is called your “coinsurance maximum”. For instance, assume that your coinsurance is 20 percent, and that your coinsurance maximum is $5,000. Even if you had an $80,000 medical procedure, you’d still only pay $5,000 at most, instead of $16,000. The bill for $16,000 would be 20 percent of the costs, but it would exceed your $5,000 coinsurance maximum. Your insurance plan would pick up the remaining costs. How Is Coinsurance Different from Copay? A copayment or copay is a fixed payment that you owe for certain medical services. Unlike coinsurance, the size of a copayment doesn’t depend on the cost of the service. You can read more about copayments here. Not satisfied with your coinsurance amounts? Want to check out other plans that contribute more towards your medical costs? Learn more about the different health insurance plans available to you. In order to find out if a specific drug is covered by your insurance plan, you’ll need to review your insurance provider’s drug formulary (the list of prescription medications covered by your health insurance plan). Your insurance provider’s formulary is a “preferred drug list” of all the medications they cover. A formulary will also list the maximum dose and quantity of each drug that can be prescribed and covered, and will note any prior approvals you require to get certain drugs. Some drugs on your plan’s formulary may be covered automatically with a doctor’s prescription; other medications may require a prior authorization from your doctor, or may be covered only after you’ve tried a different, preferred drug first. If you buy a prescription drug that is not included in your plan’s formulary, that drug will be more expensive, as your health insurance may not cover any of the cost. Look through the information you received when you compared or first signed up for your plan. If you have a specific question about your formulary, such as what tier a particular drug is in, or whether a medication requires prior authorization, your insurance company’s customer service representative may be able to help you over the phone. Most formularies organize the drugs they cover into a hierarchy of separate “tiers,” which are classified by cost. Drug tiers convey to policyholders how much a specific medication will cost; the tier under which a particular drug is categorized determines how much a policyholder will need to pay out-of-pocket to get that drug at the pharmacy. Because drug tiers are not standardized, not all insurance providers will organize their formularies into the same number of tiers. A particular drug may be classified as Tier 1 in one insurance plan, but classified as Tier 2 under a different insurance plan–the same drugs aren’t always categorized in the same tiers. Upon enrolling in a plan, insurers typically provide policyholders with a pamphlet or documentation listing the medications that are included in their plan’s formulary, along with an explanation of the copays and/or coinsurance associated with each drug tier. If you’re dissatisfied with your plan’s drug formulary, you can always shop for a new health insurance policy. Search our database of individual health insurance plans to find the right plan for you. Medicare coverage for nursing homes is essentially nonexistent; Medicare usually does not cover nursing home costs. Nursing homes are considered to be custodial care, not medical necessities. Medicare only covers hospital and medical bills – things that it considers medically necessary. The exception for Medicare is the Part A skilled nursing benefit, which provides 24/7 in-patient care after a hospitalization for up to 100 days. Skilled nursing facilities help patients after an injury – they’re not nursing homes in the sense that nursing homes are often a designated place for the care of aging seniors. Nursing home coverage is best provided by long-term care insurance, purchased well in advance of the recipient needing nursing home coverage. Otherwise, he/she might not meet underwriting and will be paying a substantial premium for meager coverage. If a senior needs to move to a nursing home and cannot afford care, Medicaid is also an option to look into. Learn more about Medicare coverage at HealthCare.com. Some Medicare Advantage plans may also include a long-term care component. I’m Turning 65. Can I Get Medicare While Still Working? If you’re still working at 65, and you’re eligible for Medicare, you may not have to sign up right away; however, we highly recommended signing up for Medicare as soon as you’re eligible. If you don’t closely follow the rules that allow you to postpone enrollment in Medicare, you may face significant financial penalties when you do enroll. Remember, Medicare is split into two sections – Part A and Part B. Together, this is the federal insurance program also referred to as “Original Medicare”. While you don’t have to enroll in Medicare while still working, you might want to enroll in at least Medicare Part A while postponing Part B. Occasionally, 65-year-olds enroll in Part A (which includes premium-free hospital coverage) and delay enrolling in Part B (which includes outpatient care and has considerable monthly premiums). There are also other aspects of the Medicare program, such as prescription drug coverage and private supplementary coverage, but they require both Part A and Part B first. If you’re receiving Social Security benefits, then you’ll have to sign up for Medicare Part A even if you delay enrolling in Medicare Part B. The employer offers “creditable coverage”, or coverage with benefits that are at least equivalent to Medicare. You’ll want to confirm, in writing, that the coverage you’re using is creditable coverage. Contact your employer, insurance company, or Social Security if possible. If you meet the above conditions, then you can delay enrolling in Medicare for up to 8 months after you (or your spouse, if you’re receiving coverage through them) have stopped working at the job that provides your current insurance. You’ll have to enroll in person at your Social Security office once you do want to receive Medicare, since this scenario usually can’t be handled over the phone or online. You have VA health coverage. Nearly all Americans over the age of 65 are enrolled in premium-free Medicare Part A, including all Social Security beneficiaries. Instead of delaying enrollment, you could opt out of Medicare forever if you really wanted to. You’d need to speak with Social Security to opt out entirely, but this is rarely done. It’s safe to postpone your coverage if you’re comfortable doing so. You’ll want to consider the financial implications of doing so first, since most Medicare beneficiaries are satisfied with their coverage and healthcare costs. You can generally join Medicare Supplement or Medicare Advantage without penalty within a few months of getting both Medicare Part A and Part B for the first time. Medicare Supplement and Medicare Advantage are two very important programs which help pay your out-of-pocket Medicare costs. You can see if your current health insurance will allow you to postpone Medicare enrollment. If Medicare turns out to be a better option for your needs, browse our selection of Medicare Supplement plans to find coverage that will last a lifetime. Medicare Supplement Plan F enrollment ends for good on January 1, 2020. Both regular Plan F and the high-deductible version of Plan F (HDPF) will be affected. With Medigap Plan F going away, Medicare beneficiaries will have fewer options available to them. After 2020, new Medicare Supplement enrollees will still be able to join Medicare Supplement Plan G. Plan G is almost identical to Plan F. Plan G does not cover your annual Medicare Part B deductible of $183 – otherwise, it’s exactly the same as Plan F, the most popular and comprehensive Medigap plan. HDPF is a great choice for those who want Plan F’s “full coverage” level of benefits but are confident in their ability to save money on their care. It’s likely that a high-deductible version of Plan G will be available for purchase by 2020. There are no other high-deductible versions of Medigap plans available at this time. If you join Medigap Plan F or HDPF by December 31, 2019, you can still keep your Plan F coverage forever. You’ll even be able to switch between different Plan F carriers if you choose. Since Plan F is the most popular Medigap plan, insurance companies will continue to maintain it for existing customers well into the future. After all, there are still policyholders of other plans, like Plan J, that were discontinued many years ago. Policymakers have not seriously discussed introducing any new Medicare Supplement plans to replace Plan F or Plan G.
We’ll connect you to local Medicare Supplement plans – including Plan F and Plan G – so that you can enroll in your favorite plan on time. Are There AARP Medicare Plans? Yes, AARP Medicare plans do exist, and you can buy various forms of Medicare coverage from AARP; however, AARP itself is not a health insurance company. AARP is one of the most recognizable Medicare plans in the marketplace. You’ll notice on any of the marketing materials for AARP Medicare plans that it’ll usually include words like “insured through UnitedHealthcare” or “from UnitedHealthcare”. That’s because UnitedHealthcare Insurance Company is the actual provider of Medicare coverage that is marketed through AARP. AARP receives a royalty from UnitedHealthcare in exchange for the use of its name and brand. UnitedHealth is one of the largest health insurance companies operating in the U.S.
You can compare Medicare Supplement and Medicare Advantage plans from AARP and UnitedHealthcare on HealthCare.com. How Does Medicare Part B Work? Medicare Advantage, also known as Medicare Part C, operates more like traditional health insurance than Original Medicare (Medicare Part A & Part B). To enroll in Medicare Advantage, you’ll have to choose a plan and sign up through a broker or insurer. Medicare Part C is offered by multiple private insurance companies. You can’t join a Medicare Advantage plan until you enroll in Original Medicare. If you decide to enroll in Medicare Part C, it will replace your Original Medicare coverage. Once you enroll in Medicare Advantage, you’ll only interact with your insurer and their provider network. However, you’ll continue paying for Original Medicare, which the federal government will use to reimburse your Medicare Advantage insurer. Fortunately, your plan will help you consolidate these bills. Medicare Advantage plans work to cover all Original Medicare services and may offer additional benefits. Unlike Medicare Supplement plans, which are standardized no matter who sells them, private insurers can choose what their Part C plans offer. Insurers may define their own premiums, deductibles, copayments, and physician referral systems. Your Medicare Advantage plan will negotiate payments to doctors that may be higher than what they receive from Original Medicare. However, fewer doctors will be enrolled in your Medicare Advantage plan compared to Original Medicare. The average Part C plan cost $31.40 per month in 2017. For a small additional premium, many Medicare Advantage plans cover prescription drug costs (replacing Medicare Part D coverage). Most Part C carriers have a zero-premium plan available, with higher copayments or fewer additional benefits. You only need to enroll in Part C one time. We recommend visiting our Medicare Advantage comparison tool, or asking us to connect you with a local broker who can offer a free, no-obligation quote. Will My Uninsured Medical Expenses Count Toward My Deductible? Unfortunately, uninsured medical expenses (that is: medical costs that aren’t covered by your insurance plan) will NOT help you reach your deductible. Your deductible is the amount of money that you spend on covered medical expenses before your health plan shares the cost of your care. For example, if you visited a doctor who wasn’t part of your insurance plan’s network after your deductible was reached, your insurer wouldn’t pay the doctor. Accordingly, medical costs that aren’t covered won’t count towards your deductible either. This is why it’s important to seek care that’s covered by your insurance whenever possible. Uncovered medical costs also won’t affect your plan’s out-of-pocket maximum. Medical devices that aren’t covered by your plan are treated the same way. Even if your treatment was necessary and appropriate, only covered costs will count towards your deductible. You can ask a doctor to give you a prescription or referral that your insurance will cover. Some plans won’t cover specific drugs because they prefer to cover a very similar drug instead. In limited circumstances, such as the need to see a specific doctor for a rare disease, your health insurer can pre-approve out-of-network care. Your plan may share the costs or pay for it as if it was in-network care. Some health insurance plans offer limited recognition of out-of-network claims, or have a separate out-of-network deductible. If you visit a doctor and pay out-of-pocket, then it may be worth submitting a bill to your insurance company. Although your plan won’t be required to count the bill against your deductible, they may have adopted a more generous policy. Health savings accounts and flexible spending accounts have more lenient rules about medical costs. If you have an HSA or FSA, you can still use them to pay for qualified medical expenses whether or not they’re covered by your insurance policy. If you find that your healthcare coverage is too limiting for your needs, then consider finding another health insurance policy. Search through our database of plans to find a policy that works best for you. Can You Be Denied Supplemental Insurance for Medicare? When you age into Medicare by turning 65 years old, you cannot be denied supplemental insurance for Medicare. You also can’t be charged extra on account of your medical history. After a few months, supplemental plans will be free to charge you higher prices or deny you outright, depending on which type of supplemental coverage you want to join. So, whether it’s a Medicare Supplement plan or Medicare Advantage coverage, you should not be denied for coverage. Your Medicare Supplement Open Enrollment Period lasts for six months, starting from the 1st day of the month when you’re both 65 and join Medicare Part B. During your Open Enrollment Period, insurers cannot deny you coverage or increase the price of your plan due to medical conditions. Once your Open Enrollment Period has ended, you’ll only have the guaranteed right to purchase a Medigap plan at the lowest possible rate if you qualify for a Special Enrollment Period. Fortunately, there are many ways to qualify for special enrollment. Thirty-one states also require Medigap issuers to offer plans to Medicare beneficiaries under the age of 65, although not all plans may be available or affordable. In New York and Connecticut, insurers cannot deny or charge extra for Medigap at any time. When you first become eligible for Medicare, you’re granted a 7-month Initial Enrollment Period (IEP) to sign up for Medicare Advantage. Medicare Advantage plans are privately-run options that replace your Original Medicare coverage (Parts A & B). Your IEP begins 3 months before the month that you turn 65, and lasts for 3 months after the month you turn 65. If you missed your IEP, you can also enroll in a Medicare Advantage plan during the Annual Election Period (AEP). AEP lasts from October 15 to December 7 every year. In general, you can’t be denied coverage or charged more due to a health condition if you apply for Medicare Advantage during AEP. However, Medicare Advantage plans are not required to accept beneficiaries who qualified for Medicare due to a diagnosis of end-stage renal disease. Learn more about Medicare coverage, and consider which options will fit your budget. You can browse our collection of Medicare Supplement and Medicare Advantage plans to find what’s best for you. An HMO, also known as a Health Maintenance Organization, is one of the most common types of insurance plans. In HMOs, there’s less separation between medical professionals and your insurance company. If you enroll in an HMO, you’ll be limited to a network of doctors and facilities that are closely linked to the HMO. The medical professionals you see may be direct employees of the HMO. In an HMO, you’ll generally have to choose a doctor known as a primary care provider (PCP) that is part of the provider network of the HMO. When you have a medical issue, you’ll visit your PCP. Your PCP will work closely with your insurer. If you need to see a specialist, you’ll often need to get a doctor’s referral from PCP. The specialist you see will be restricted to a doctor within your HMO’s network. You may not need referrals for preventive care. HMO plans must also cover emergency care even outside of the network. HMOs have more control over its doctors and facilities than other types of plans. HMOs limit the number of providers in their network so as to keep costs down. As such, they’re generally cheaper than comparable plans. HMOs are one of several types of common health plans – like PPO, EPO, and POS plans – that you may learn more about. You can browse HealthCare.com with confidence, knowing that you understand the differences between insurance plans available in your area. Use our intelligent plan selection tool to choose an HMO if you prefer, or request an HMO on the phone from one of our affiliated brokers. What Is a Doctor Referral? Some medical care has to be ordered by your primary care doctor. While you can visit a clinic or emergency room without prior authorization, other circumstances will require you to get a doctor’s note before receiving care. This note is called a referral. To get a doctor referral you’ll generally want to visit your primary care provider – whether they’re a family practitioner, internist, or pediatrician. If you have an injury to a body part, you could also visit a doctor who treats that body part. The doctor will screen your condition and give you a paper referral that you can take to the doctor of your choice that’s covered by insurance. For instance, you can’t ask for an X-ray on your own. Your insurance policy might also ask you to get a referral before you visit a highly specialized doctor, like a cardiologist. It’s very common for doctors to approve referrals, and your doctor should be happy to do so. If your plan lets you see a specialist without a doctor referral, that specialist may still need to write a referral for diagnostic tests or additional specialists. For example, a podiatrist (foot doctor) can write you a referral for multiple physical therapist visits. Sometimes getting a referral when you don’t need one will make it more likely that your plan approves your continuing care in the future. When scheduling a visit with a medical professional for the first time, it’s a good idea to ask if they need a doctor referral from your insurer. You’ll want to make sure that the medical professional you’d like to see can accept you as a patient. You can evaluate your health coverage and see if it’s the best option for your needs. Looking to switch to plan that won’t require a doctor referral to see a specialist? Search our database of individual health insurance plans to find the right plan for you. Can I Get Health Insurance with Pre-Existing Conditions? Thanks to the Affordable Care Act, you’re able to get health insurance even if you deal with pre-existing conditions. This applies whether or not you get health insurance by yourself or through your employer. Whether or not you sought treatment for the health issue before your coverage began, it will still be covered. A pre-existing condition is a health issue that was present before a person enrolled in a health insurance plan. Pre-existing conditions are not uncommon. Anywhere from 27 percent of Americans (according to the AARP) to 50 percent of Americans (according to the Department of Health and Human Services) under the age of 65 have a medical issue that insurance companies would have categorized as a pre-existing condition. CNN believes that the most common pre-existing conditions were acne, anxiety, diabetes, asthma, sleep apnea, depression, COPD, obesity, atherosclerosis, and cancer. Health insurance plans that serve as alternatives to the Affordable Care Act, such as short-term medical policies or Christian health plans, continue to set their own rules for pre-existing condition coverage. You probably won’t encounter this issue unless you specifically seek out these types of insurance. If you enroll in a Medicare Supplement policy (also known as Medigap), then your supplementary coverage for conditions that were previously diagnosed or treated may be postponed for up to 6 months if you were uninsured before enrolling. However, your Original Medicare will still cover pre-existing conditions. If you’re looking for a traditional, year-long health plan, you can apply for the health insurance policy without fear of rejection. If you believe you have a pre-existing condition, you can also apply for alternative coverage such as temporary health insurance without penalty. Medicare Advantage is a privately-run alternative for Original Medicare (Medicare Parts A and B), with smaller doctor networks but extra benefits. Medicare Advantage is formally known as Medicare Part C.
If you choose to enroll in Medicare Advantage, it will replace your Original Medicare coverage. Medicare Advantage enrollees need to continue paying any Part A and Part B premiums to stay enrolled in the program. However, Part C offers all of the services that are included in Medicare Part A and B.
Medicare Advantage operates more like traditional health insurance than Original Medicare. Multiple private insurers offer different Part C plans. Out-of-Pocket Maximums Under Medicare Advantage: There’s a limit to the amount that any Medicare Advantage plan can ask you to pay in a single year. As of 2017, a plan can ask you to pay no more than $6,700 or less before you reach your annual out-of-pocket maximum. Your monthly premiums and prescription drug costs don’t count towards your out-of-pocket maximum. You’ll still pay those costs if your out-of-pocket maximum is reached. Medicare Advantage plans can also choose to provide additional benefits that are not offered by Parts A & B. You can bundle important benefits such as hearing aids, travel insurance and prescription drug coverage into your Part C plan. Unlike Original Medicare and Medigap, the benefits offered by your plan may change every year. Review your Medicare coverage to see if it meets your needs. You can browse our selection of individual Medicare Advantage plans to find what’s right for you. What Do I Need to Know About Medicare Disability Eligibility? To qualify for Medicare disability eligibility, You’ll need to either collect Social Security Disability Insurance (SSDI) or have a diagnosis of end-stage renal disease (ESRD). As a Medicare beneficiary you’ll receive complete Medicare coverage, including coverage for disability-related issues. SSDI: If you’ve just begun to receive SSDI payments, you can’t enroll in Medicare right away. Your enrollment begins automatically on the 25th month that you receive SSDI benefits. You’ll get your Medicare information and the official card in the mail soon after your 23rd month of receiving SSDI. The 24-month requirement is cumulative, meaning that you don’t need to have received all 24 months during the same 24-month period to qualify. If you have ALS (amyotrophic lateral sclerosis), your Medicare benefits will begin as soon as you receive your first SSDI payment. It typically takes 5 months for your first SSDI payment to arrive. ESRD: If you’ve received a diagnosis of end-stage renal disease, you can enroll in Medicare by contacting your local Social Security office. To qualify, you must already receive SSDI or have worked in the U.S. for about 10 years to have paid a sufficient amount of taxes. If you have ESRD but don’t meet those requirements, you can also get Medicare if you are the spouse or dependent child of a person who would have qualified. The start of your Medicare coverage will depend on the type of treatment you receive. If you take part in a home dialysis training program, your coverage will kick in during the first month of dialysis. If you receive treatment at a dialysis facility, coverage will begin after your fourth month of dialysis. If you’re admitted to the hospital for a kidney transplant or transplant-related health services, your coverage begins during the first month that you’re admitted. If your transplant is delayed for more than two months after you’re admitted to the hospital, then your coverage will start two months before your transplant. Prepare to enroll in Medicare as soon as possible. Consider which type of supplementary coverage is right for you. Sign up early for Medigap coverage that starts as soon as you receive Original Medicare. Can I Have Both Medigap and Medicare Advantage? It is against the law for anyone to knowingly sell you a Medicare Supplement (Medigap) policy if you plan to stay on Medicare Advantage, and vice versa. You don’t need Medicare Advantage if you already have Medicare Supplement. Each type of plan covers many of the same things, so you’d be wasting your money. This means that you can’t have both Medigap and Medicare Advantage at the same time. Medicare Supplement plans are meant to fill your coverage gaps not paid for by Original Medicare (the government-run program also known as Medicare Part A and Part B). There are a number of blind spots in Original Medicare, any of which could burden seniors who lack supplementary coverage with significant out-of-pocket costs. Having a Medicare Supplement policy on top of Medicare Part A and Part B generally makes a lot of financial sense. If you rely on Medicare Advantage coverage, you won’t need a Medicare Supplement plan. The two types of coverage aren’t even compatible, since each Medicare Advantage plan will have different cost-sharing rules than Original Medicare. Medicare Advantage plans operate similarly to what you’d find in traditional health insurance – they typically operate as an HMO, PPO or POS plan. Since Medicare Advantage’s provider network is more tightly managed than Original Medicare, Medicare Advantage plans can offer you insurance with fewer coverage gaps. The rule against buying Medicare Supplement and Medicare Advantage at once protects Medicare beneficiaries from unknowingly buying something they don’t need. For starters, don’t try to buy both types of supplementary coverage at once. Maybe compare each plan type and decide? Once you know what you want, we’d be delighted to give you a free, no-obligation Medicare Supplement or Medicare Advantage quote. Annual exams + preventive care are covered. Some HDHP insurance plans also provide access to health savings accounts (HSAs). Like their name implies, consumers covered by HDHP insurance pay a smaller premium amount each month, but they must also pay thousands of dollars out-of-pocket before insurance begins to cover the cost of their medical expenses. While high-deductible health plans cost less than traditional insurance coverage on a monthly basis, HDHP insurance coverage can also be problematic if you get sick and need healthcare. While high-deductible health plans can be considered as a type of “catastrophic coverage”, this type of plan comprises its own health insurance category. Additionally, the Internal Revenue Service (IRS) determines HDHP deductible thresholds and qualifying criteria (these guidelines change from year to year). For calendar year 2017, HDHPs plans must have a deductible of at least $1,300 for individuals and at least $2,600 for families. Of course, the deductibles may be larger – and often are. The IRS does provide some financial protection in the form of out-of-pocket maximums to people who are enrolled in HDHPs. In 2017, HDHP out-of-pocket maximums were set at $6,550 for individuals and $13,100 for families covered under the same plan. Slight adjustments to these limits are slated for 2018. HDHPs – like all plans under the ACA – are required to cover the cost of in-network preventive care, such as annual checkups, immunizations, and well-woman exams – whether or not the policyholder has met her plan’s annual deductible. Some HDHPs may be compatible with a health savings account (HSA). HSAs allow those enrolled in high-deductible plans to use pre-tax dollars to pay for their medical and healthcare expenses. Money in an HSA belongs to the consumer and any funds left over at the end of the year carry over into the next year. Additionally, money in an HSA – and the interest earned on it – isn’t taxed. An HDHP does not guarantee that your employer offers an HSA, only that they can. Not all HDHPs are HSA-compatible. Being subject to a deductible over $1,300 does not make your plan HSA-compatible by default; HDHPs must be established as HSA-compatible by your insurance carrier. Money in an HSA continues to belong to you, even if you change jobs or retire. HDHPs cover the cost of prescription drugs that are considered “preventative.” Drugs that aren’t considered preventative must be paid for in full if you have yet to fulfill your out-of-pocket deductible. In other words, drugs must be included under your HDHP provider’s list of approved medications to be covered in full and do not count toward your deductible; if you take a drug that is not on your insurer’s list, you’ll need to pay for your prescription medication out-of-pocket until you meet your plan deductible. Note: whether or not a medication qualifies as “preventative” is determined by your insurance carrier, so a particular drug may be considered preventative under one plan and not by another. If you’re unsure whether a particular medication is considered preventative under your plan, call your insurance provider to ask. The most important thing to remember with a HDHP is that every decision you make about your medical care counts. HDHPs require consumers to take ownership and initiative over their own care, so it’s crucial for consumers to know what is and isn’t covered under their plan. Many routine health services intended to keep you well (e.g. colonoscopies, mammograms, and vaccinations) are covered at 100 percent by HDHPs. Policyholders should have a comprehensive understanding of their HDHP coverage, so they know what’s free. Short-term health insurance is different from other types of coverage. These plans are designed to keep you protected from medical or financial catastrophe in case of an emergency. Short-term insurance isn’t a reliable way to maintain your health for long periods of time. While traditional health insurance plans must help you pay for the 10 ACA essential health benefits, short-term plans don’t cover these benefits very well. In fact, short-term health insurance plans are under no obligation to offer any specific benefits. Short-term health insurance can safely get you through a variety of temporary situations. However, short-term plans aren’t designed to compete with major medical health insurance (popularly known as Obamacare) when it comes to taking care of your ongoing medical issues. For instance, short-term plans will almost certainly cover hospitalization bills, yet almost certainly exclude maternity coverage. Most short term plans will offer you at least one doctor’s checkup at a low cost over the course of your plan, but they won’t cover treatment for management of a pre-existing condition. You Will Get Emergency Care: Peace of mind from unexpected medical costs is a major benefit of short-term coverage. If you’re seriously ill or injured, short-term health insurance will cover the costs of your hospital visit. Short-term policies also cover follow-up care for acute medical issues until your coverage ends. You Can See a Primary Care Doctor: Nearly all doctors accept short-term insurance. You will receive a welcome letter, insurance card, and other familiar benefits when you enroll. Although you have to pay for care on your own before hitting your deductible, the costs for a visit once you do reach your deductible are generally low. Some plans also include a checkup, free of charge. You Can See a Specialist: Specialized doctors (such as a dermatologist, orthopedist, or neurologist) are frequently covered by short-term plans. Medical imaging (like x-rays) and mental health care are also common short-term benefits. Short-term plans often bundle in additional benefits such as life insurance or prescription drug discounts. If you’re considering a short-term health insurance plan, you probably understand that your coverage will be limited compared to what you’d get with a major medical plan. Different short-term plans will cover Obamacare’s 10 essential health benefits in different, limited ways. Don’t expect your coverage to take care of your long-term needs. If you compare plans before you buy, you’ll have a better idea of what’s covered. Short-term plans may look similar to other forms of health insurance, but they won’t operate in the same way when it comes time to pay. Since these plans don’t give you comprehensive health coverage, you’ll still pay a fee at tax time. There are many unique situations where buying a short-term health plan makes sense. If you’re not able to buy a traditional plan until open enrollment, short-term insurance is a great option. Students, travelers, and new employees waiting for their coverage to begin have traditionally been safeguarded by short term health insurance as well. It’s time to browse our collection of temporary health insurance plans. You can compare plans and enroll in your favorite one today. If you’re looking for a more comprehensive plan covering the ACA essential health benefits, we can help you find a major health insurance policy. How Does a Doctor’s Referral Work? Your doctor referral rules will depend on your specific plan. You’ll have a better understanding of the referral process – including whether you need a doctor’s referral – after you’ve gotten your first referral. Doctor’s referrals are often provided by your primary care physician. Since each plan is different, you can call your insurance provider to learn about your plan’s referral procedure. You can also look at your plan’s manual online, or request a paper copy. Medical offices may be able to help you navigate your insurer’s procedures, but they might not have specific information about your plan. You’ll generally need a doctor’s referral for specialized tests. For instance, you can’t order an x-ray on your own. If you’re staying in-network, you can generally take your doctor’s referral to any medical professional that’s willing to treat you. If you’re hospitalized, referrals to different departments in the hospital will be managed by the hospital. Whether or not you’ll need a referral to see a certain doctor primarily depends on the type of plan that you have. HMO or POS: You’ll probably need a doctor’s referral if you have one of these plans. These plans are based around the need to check in with a primary care physician (PCP) before you access specialized services. PPO or EPO: You probably won’t need a referral for most specialists in a PPO or EPO as long as you visit an in-network doctor. Original Medicare (Part A+B): With Original Medicare, you can generally see any doctor you like, as long as they accept Medicare. Medicare Advantage (“Part C”): Since Medicare Advantage operates more like traditional insurance than Original Medicare, you can’t see just any Medicare doctor. Some Part C plans are structured as HMOs, where you’ll need to check in with your primary care physician to get a specialist referral. Other plans are PPOs, where you won’t need a referral for in-network care. Self-pay: You’re free to pay a medical professional on your own if you’d like to see them without a referral. You may need to sign a waiver stating that you accept full responsibility for the cost of your visit. Although the main use of referrals is for your doctor to bill your insurance, you may need a doctor to write you a referral for services that you can’t order on your own. What If I Don’t Have a Referral When I Go to the Doctor? Many specialists won’t even see you without a doctor’s referral unless you’re willing to pay up front. You can plan ahead by scheduling appointments with your primary care doctor and the specialist you’d like to be referred to before you receive a referral. How Long Does My Referral Last For? You’ll want to ask your doctor how many visits their referral will last for. Note that your doctor may write a referral for longer than your insurance company will accept. You may receive a follow-up letter from your insurance company confirming the details of your referral. You can get multiple referrals to the same doctor once the original referral expires. You can evaluate your health coverage and see if it’s the best option for your needs. Search our database of individual health insurance plans to find the right plan for you. Is There a Cap on Medicare Supplement Benefits? There is no cap on Medicare Supplement benefits to the insured senior: no annual caps, no lifetime caps, and no caps on dollar amounts. Without Medicare Supplement coverage, your 20 percent coinsurance on Medicare Part B care would also continue forever. In the absence of Medigap, there’s no cap on what your out-of-pocket expenses could be as a Medicare beneficiary. Fortunately, Medicare Supplement plans fill in these coverage gaps (that’s why they are called “Medigap”). Your Medigap insurer will cover your entire 20 percent coinsurance. Each of the 10 Medigap plan types take care of your Part B coinsurance as one of the core Medicare Supplement benefits. Beyond that, they treat different benefits differently. HealthCare.com can help you compare plans on our website, or by connecting you to a licensed broker. You can review your current Medicare coverage to see if it’s the best option for your needs. Browse our selection of individual Medicare Supplement plans to find what’s right for you. Does Insurance Cover Contact Lenses? If you’re wondering whether your health insurance covers contact lenses: it probably doesn’t. Whether you purchased insurance yourself or through an employer, the chances are very slim that your plan will cover contacts. However, your plan may offer a prescription lens discount at select retailers. Plenty of carriers offer surprisingly affordable vision-only insurance policies that are separate from your main health insurance. These will work like traditional health insurance, but will only cover vision care. You’ll want to compare them to see which one offers the best contact lens coverage. If you’re covered by Medicare, Original Medicare (Parts A and B) does not cover the cost of contact lenses. If you have have a Medigap plan, there are no Medicare Supplement plans that add vision coverage either. One exception to this: you may receive contact lenses as a Medicare benefit following cataract surgery or other medically necessary vision procedure. Some Medicare Advantage plans (Medicare Part C) come with vision insurance. You can see if any Medicare Advantage plans in your area cover contact lenses and exams by using our Medicare Advantage plan comparison tool. No Medicaid programs cover contact lenses unless they’re medically necessary. However, all but 10 states offer eyeglasses under Medicaid. Your Medicaid program may have partnered with a vision provider that offers a discount on contact lenses and related eye exams. Contact lenses are only provided to veterans through Veterans Affairs when medically necessary. However, VA-eligible veterans may still qualify for discounts elsewhere. Virtually all medically appropriate vision care qualifies as an eligible FSA or HSA expense. Unlike FSAs, money in your HSA accumulates from year to year, allowing you to save toward the cost. Some carriers offer great standalone vision-only care, and different Medicare Advantage plans offer coverage for some vision care. Search our database of individual health insurance plans or look through your Medicare Advantage options to find the right plan for you. What Medicare Supplement Companies Offer Plans in New York? Keep in mind, though, that this isn’t a comprehensive list of insurance companies that offer Medicare Supplement plans in NY. The NY State Department of Financial Services regulates the insurance industry in the state of New York, and keeps the full list of the Medigap insurance companies in New York. In addition, not all insurers or plans operate across the state. Your individual plan options will vary according to ZIP code, whether that’s in Rochester (where you are), Western NY, Eastern NY, Buffalo, New York City, or Long Island. As of August 2017, each of the Medicare Supplement companies in New York offers Medigap Plan F (the most popular plan type), Plan A (the most basic) and Plan B. If you’re considering Medicare Supplement coverage, you’ll join 436,192 other Medigap enrollees in New York state (as of May 2017). Those Medigap enrollees represented 21 percent of the total Medicare people on Original Medicare; in other words, roughly one in five Medicare enrollees choose to supplement their Original Medicare with a Medicare Supplement plan. Further, of those, approximately 241,000 (or 55 percent of all Medigap enrollees), were enrolled in Medicare Supplement Plan F.
Look at what Medicare Supplement plans are available in New York (specific to your county), and how much they’ll cost. Compare the various Medicare Supplement plans to see which one fits your needs. HealthCare.com provides an online plan and comparison engine that includes Medigap policies from all of the NY Medicare Supplement insurance companies. Check out your options here when you’re ready. I’m 65, Married and Already Have Medicare: Is There Medicare Spouse Coverage? Medicare Spouse Coverage Doesn’t Exist: Your Medicare coverage will not extend to your spouse, or any other family member. Whether you opt for Original Medicare (Parts A & B) or Medicare Advantage (private Part C coverage), your coverage won’t apply to anyone but you. Medicare isn’t just an insurance program – it’s a benefit that you earned by contributing taxes over many years. Medicare only serves individuals who qualify. It’s not possible to extend your coverage to other people. Your spouse should apply for Medicare if they’re eligible to do so. If they’re not yet eligible to apply, they’ll need to seek out health insurance on their own. It’s inadvisable to remain on private or employer-based insurance for the purpose of keeping your spouse covered until your spouse does become eligible for Medicare, since you’d be subject to a large penalty for not enrolling in Medicare in time. Gaining Medicare Eligibility from a Working Spouse: If you’ve only lived in the U.S. for a few years, or have worked for less than 10 years, then you may not be eligible for Medicare on your own. In some cases, you may gain Medicare eligibility, including premium-free Medicare Part A, based on your spouse’s work history – even if you wouldn’t have otherwise qualified for Medicare. If you’re married, divorced, or widowed from someone who did work for over 10 years to become eligible for Medicare, then you’ll probably be eligible to enroll in Medicare using your partner’s work history. You’ll want to apply at your local Social Security office to sort out the details. Are you and your spouse looking to cover more of your Medicare-related expenses? Consider getting a Medicare Supplement plan. Search our database of Medicare Supplement plans to find the right plan for each of you. Why Is There a Medicare Part B Late Enrollment Penalty? Unfortunately, there is a Medicare Part B late enrollment penalty. The Late Enrollment Penalty: The Medicare Part B late-payment penalty amounts to an increase of 10 percent for each 12-month period that you were late enrolling in Medicare Part B. For example, if you were eligible when you turned 65, but didn’t enroll until you turned 67, you will be charged 20 percent more in Medicare Part B premiums as everyone else, for as long as you have Medicare Part B. This penalty doesn’t go away, which is why you need to do everything you can to avoid it. While government in general does have a lot of rules and regulations for little to no reason, I get the purpose of this penalty. The Medicare Part B late enrollment penalty is in place to help guide Medicare seniors to enroll in Part B at the right time. Why Medicare Charges This Penalty: From an actuarial standpoint (the people who work for insurance companies and crunch the numbers), the older you are, the more you’ll need medical services. From Medicare’s perspective, they want you to enroll in Medicare as soon as you become eligible. It helps prevent Medicare seniors from waiting until they need a lot of medical services before they enroll. The technical insurance term is that they are trying to prevent “adverse selection”. It’s best to avoid the Part B penalty altogether by not enrolling late into Part B. You can read more about the Medicare Part B late enrollment penalty on Medicare.gov. Looking to offset some of your Medicare costs? Consider adding a Medicare Supplement plan to your coverage. Search our database of Medicare Supplement plans to find the right plan for each of you. What Is the Difference Between Obamacare and the Affordable Care Act? There is no difference between the Obamacare and the Affordable Care Act. They both refer to the exact same thing. It’s a very common mistake to think that they’re different. Obamacare is the unofficial nickname for the 900-page Patient Protection and Affordable Care Act. It’s also referred to as the Affordable Care Act, and abbreviated as the ACA or PPACA. Adding to the confusion, pundits and the public alike use the term “Obamacare” to explain a myriad of loosely related healthcare issues that may or may not have anything to do with the law. Sometimes Obamacare is used to describe modern health insurance. Sometimes people use it to refer to individual plans, government-run insurance marketplaces, or specific health insurance reforms – like the ban on insurance companies rejecting people with pre-existing health conditions – that are found in the Affordable Care Act. Even changes to the Food and Drug Administration that were a part of the ACA can be called Obamacare. In reality, many aspects of healthcare in the US are mentioned in the Affordable Care Act. The ACA is known as Obamacare because the law was associated with the President at the time it was signed. While the ACA was passed in 2010, most of the law didn’t come into effect until 2014. Whether you’re looking for on-Marketplace or off-Marketplace health insurance, it helps to know that regardless of your choice, both kinds of plans are required to fulfill essential health benefits per the Affordable Care Act. Search our database of individual health insurance plans to find the right plan for you. A health insurance deductible is the dollar amount you have to pay out-of-pocket for covered healthcare and medical services before your health insurance coverage “kicks in” and starts to cover the cost of your care. One exception to this occurs under the Affordable Care Act, as the law requires marketplace plans to cover the full cost of preventative care, whether or not a policyholder has fulfilled his or her annual deductible. Health Insurance Deductible Amounts Can Vary by Metal Level: Annual health insurance deductible amounts vary from one health insurance plan to another. Plans with higher metal levels (such as “gold” or “platinum” plans) tend to have lower annual deductibles and higher monthly premiums. Plans categorized under lower metal levels (like “bronze” plans) tend to have lower monthly premiums and larger annual deductibles. In other words, plans with lower premiums have higher deductibles and vice versa. Most insurance plans have two deductible amounts: an individual deductible, which applies to individuals who are the sole policyholders covered by their plan and a family deductible, which applies when more than one person is covered under the same plan. How Long Does It Take to Sign Up for Health Insurance? We get this question a lot. If you know exactly what you want, you could sign up for health insurance in 10 minutes. The signup process for health insurance is quite simple. Depending on whether you apply for health insurance, short-term health plans or Medicare Supplement, you’ll be asked slightly different questions. That said, it will take about the same amount of time to enroll in any of these options. If you’re not familiar with different types of health insurance, it wouldn’t hurt to learn about your insurance purchase by reading our easy guides to health insurance options. Online: Depending on the website, it can take as few as 10 minutes to sign up for health insurance through an online application form. You’ll want to have your bank details and personal information on hand. Once you enter your age and location information, it could take anywhere from a minute to an hour to choose a plan that you’d like to apply to. While you can filter plans based on their monthly cost, deductible or insurer, you also have the option of reading in-depth details about each plan. The amount of time that it takes to select an insurance policy will depend on how important of a decision that health insurance is for you. Over the Phone: If you apply by calling a broker, HealthCare.com can connect you with a live broker in less than 20 seconds. We find that callers typically spend between 20 and 40 minutes on the phone when signing up for health insurance or a supplementary Medicare policy. Our partners will walk you through your options. It doesn’t take long to sign up for health insurance – you easily look for your options through ours search & compare tool, and we can make the sign-up process simple for you. Search our database of individual health insurance plans to find the right plan for you. How Long Is the Health Insurance Waiting Period After I Sign Up? There’s generally a short health insurance waiting period between when you enroll in coverage and when your plan actually begins to cover you. Your waiting period will depend on the type of insurance you enroll in, and when you purchase it. If you’re not comfortable going without insurance for 90 days, it’s possible to fill the gap in your coverage with a short-term insurance plan. First day of the month after next month, if you’ve enrolled once 16 days or more have passed during the current month. For example, if you signed up for health insurance on November 27, your coverage will start on January 1. Immediately, if you adopt or give birth to a child. Certain states may shorten delays in coverage if you apply during the Open Enrollment Period. Employer-Based Health Insurance: If your company offers health insurance, they can postpone your coverage for up to 90 days after you begin work. However, coverage can start as soon as your first day on the job, depending on the plan your employer selects. You can receive employer-based insurance even if you apply outside of the annual health insurance open enrollment period – starting a new job is a “qualifying life event” that allows you to purchase major medical health insurance. Similarly, if you have coverage elsewhere that ends after you’ve started work, you can sign up for employer-based insurance subject to the same health insurance waiting period. Medicare: As long as you plan ahead, it’s easy for Medicare and supplementary Medicare coverage to begin on the first day of the month that you turn 65 years old. There are a number of Medicare rules that determine whether you’re automatically enrolled and when your coverage will begin. Medicaid: If your application for Medicaid is approved, then coverage will begin on either the day that you applied or the first day of the month that you applied. The specific rules will depend on your state, and will be detailed in your application. COBRA: Since you’re continuing your health insurance when you elect to use COBRA, there’s no health insurance waiting period to enroll. Whether you’re looking for a few different Medicare coverage options or private health insurance, we can help you find it. Search our database of individual health insurance plans or look for a Medicare coverage option and find the right plan for you. Let one of your experts help you.